Yesterday was a very cold day; winter has finally begun & it was a day of bitter winds & showers with even a little hail. Just as well it was Saturday & I was home all day to keep the house warm, dry & snug. I took Lucky to the vet for her flu vaccination first thing - which is a tale in itself. I had made an appointment to take both cats for the vaccination last Monday. When I arrived home from work, Phoebe was there but psychic Lucky was nowhere to be seen. I called, I searched, I rattled the nibbles bag - nothing. I think my mistake was getting the cat carriers out, ready to go, before I went to work. Lucky is a wary soul & made herself scarce. Of course, when Phoebe & I returned from the vet, who should come sauntering towards us, looking completely unconcerned & wanting her dinner? So, I had to make another appointment. After I brought Lucky home, I went to the farmers market, the greengrocer (for the things I couldn't find at the market) & then home. After a bit of housework, I made coffee, sat down to read Genji & before too long, Lucky was on my lap & Phoebe was in one of her favourite spots, on the top of the chair behind my head & they didn't move very much for the rest of the day. 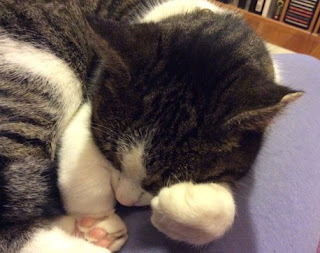 It reminded me of Eleanor Farjeon's poem, Cats Sleep Anywhere. It's one of my favourite photos of Phoebe. She does love to curl herself up into the smallest possible ball when she's asleep. She knew her cats alright! 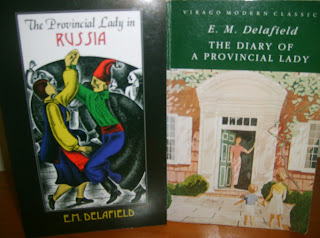 I love her connection with Edward Thomas - his dear wife would have given up Edward to Eleanor if she had thought it would have made him happy . . . I don't think anything would have made ET happy! Eleanor's memoir of their friendship is very fine though. Many decades ago, I was thinking of adopting a cat from the Humane Society and was given a multi-page questionnaire to fill out. One of the silliest questions was "Where will your cat sleep7"
I wish I had know of this poem back then. I ended up adopting a cat from the Animal Control Center run by the county. Exactly - cats sleep wherever they please. 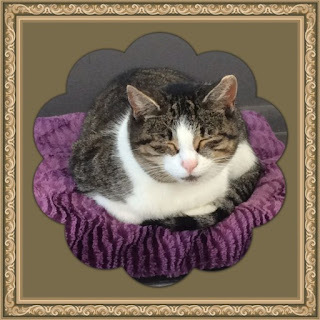 I've given several specially purchased cat beds to the Animal Aid shelter because they would rather sleep on my bed or anywhere else except a cat bed. Yes, that was certainly written by someone who lived with cats! As soon as I saw the first photo I knew it had to be this poem! It's wonderful, and so true. We've had two cats over the years, and favourite sleeping spot for both of them was perched on top of the garden fence! I love the cat pictures! I read some Eleanor Farjeon when I was a kid but (The Silver Curlew? something like that) but missed out on this witty poem.